Timothy has great potential for power—no magic necessary—in this start to an action-packed fantasy series from two New York Times bestselling authors. In Timothy’s world, everyone has magical powers. Except him. He has spent his entire life as an outcast hidden on a remote island. When he is finally taken back to the city of his birth, Timothy is fascinated by the current of magic that fuels the world and mesmerized by the buildings and orbs that hang weightlessly in the sky. But he is also marked for death. Assassins are watching his every move, and some very powerful people want him destroyed. Timothy can’t imagine what threat he could possibly pose; after all, he wields no power in this world. Or does he? 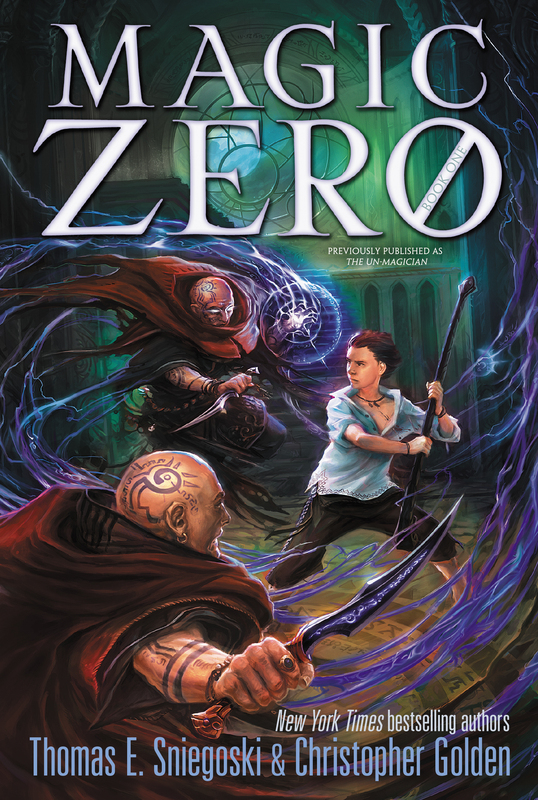 This first book in the Magic Zero quartet, originally known as the Outcast series, features a refreshed cover and an unforgettable adventure. The city of Arcanum was in mourning. Black bunting unfurled from open windows, and the flags of every magical guild had been lowered to half-mast. The ghostfire that burned inside the city’s spherical street lanterns had been altered in hue; once golden, it was now scarlet, and would remain so for one full week. Many shops and offices were closed, and thousands of the city’s mages had turned out to observe the funeral pyre that raged in the center of Temple Square—all to witness the ritual burning, all to mark the passing of Argus Cade. In that grieving city, very few others were out and about this night, and those who were gave no notice to the ornate silver carriage that swept through the streets. It floated silently along, crimson lantern light splashing upon its surface, taking the twists and turns of its route with a deftness that revealed the skill of its driver. The silver vehicle whispered through the city several feet above the cobblestones. The carriage doors were emblazoned with a lion about to pounce, the family crest of its occupant. At each of the four corners of the carriage was an image of a silver dragon curled in a mysterious repose. Perched upon the carriage’s high seat was a man draped in deep blue robes, a heavy veil covering his face. His hands were held out in front of him and from his fingertips tendrils of crackling cobalt energy sparked toward the ground far below, fingers of cerulean fire investigating the road ahead of the carriage. He was a navigation mage, just as his father had been, two generations spent perfecting the sorcery of transportation. It was a worthy endeavor. Honest work for an honest man. Inside the vehicle was Leander Maddox, the man whose family crest adorned its doors. The carriage made the slightest of hums—generated by the navigator’s magic—but it was little more than white noise to him. Leander was lost in thought, adrift in the aching sadness left behind in the wake of the death of his mentor and greatest friend. He forced himself to focus on the task that lay before him. As Argus Cade’s apprentice, it fell to him to close down the old sorcerer’s residence and to collect whatever papers or journals he might have left behind. “Argus,” Leander whispered to himself, raising a massive hand and covering his face with it. A sigh escaped him and he shuddered, settling more deeply into the velvet seat within the carriage. The loss pained him deeply. Argus Cade had been the greatest sorcerer of his generation, a master of the magical sciences, an adviser to kings and prime ministers, but to Leander all of those things paled beside the man’s kindness and courage. He had been more than a mentor. He had been an example. Leander had lost his own father as a boy, and Argus had always given him the guidance he would have wished for from a father. And in the midst of the political games and power struggles of the Parliament of Mages, Argus had never compromised his beliefs, never allied himself with anyone who did not share them, and never kept silent to avoid controversy. He was his own man, and had earned great respect for that position. Leander glanced out the window at the street lanterns, scarlet ghostlights throwing red shadows on the nearby homes and shops as the carriage climbed through the winding street that led up into August Hill, the most exclusive neighborhood in Arcanum. How often as a young man had he trod the cobblestones and steps of this hill on his way to Argus’s home? Still each doorway, each sign hanging outside the window of a pub, was familiar. The navigator slowed the carriage as the street twisted once more, rising up toward the pinnacle of August Hill, where homes hung alongside the ground itself, magic woven into every bit of architecture to keep them aloft. Lower down, the buildings were constructed upon the ground, but as the terrain became steeper, the houses were merely anchored to the earth, jutting out at level angles from the side of the hill. The sadness in his heart made Leander close his eyes again. He had been here only three nights past . . . the very night that Argus had died. With his eyes closed he could not stop his mind from slipping back in time, from reliving again those tragic final hours of a great man. Argus had been in his bed, the lamps burning low, a gloom settling upon his chamber. He had always been thin, but Argus had become almost skeletal. His long, hooked nose even more prominent than usual, jutted from his sallow, weathered face. From time to time Argus would open his eyes and there would be a light in them, a spark, and he would laugh and reminisce about the days when he had first met Leander. As a professor at the University of Saint Germain, Argus had taken the burly, leonine man under his wing, and when they were seen together, other mages would remark on what an odd pair they made. In later years, well after the death of Argus’s beloved wife, Norah, the mage had grown withdrawn, keeping his own counsel, and allowing only Leander into his private thoughts. Other than his household servants, the outside world saw Argus only rarely, though he made his opinions known to Parliament and to the heads of the guilds often enough. Leander was a professor at the university himself, now, in the very chair Argus had once held. He had been the great sorcerer’s student, his apprentice, and his only real friend. Leander felt blessed to have had Argus Cade in his life. But there were things other than grief haunting him now, though all of them connected to Argus’s death. Not all of the old mage’s ramblings had been sensible, not all of them accompanied by that spark in his eyes. Indeed, some of the things he had said as his spirit was slipping away, as his body and mind were failing him, had confounded Leander greatly. The hum of the carriage grew louder and the world outside its windows darker, with only the faintest hint of red hues. There were only a few homes this high upon August Hill and, this far from the ground, it required great effort and magical skill for the navigator to carry them here. Leander barely noticed. His thoughts had been in turmoil ever since Argus’s death, but in among that jumble there was something more subtle that was bothering him. Though it was nonsense, it haunted him more with each passing hour. In his rambling Argus had said things that were . . . simply impossible. The ravings of a fevered brain. At the end, when every breath came in a rattling rasp and seemed likely to be his last, the old sorcerer had let his head loll to one side and, spying Leander, had thrust out a hand and clutched his arm with a ferocious, preternatural strength. In that moment, though he had tried to deny it to himself, Leander had seen utter clarity in Argus’s eyes. Total focus. Despite the clarity he saw in Argus’s eyes, Leander had told himself that it must be the nearness of death talking. Norah Cade had died while giving birth to their only child, Timothy, and the trauma of his entrance into the world had been too much for the infant; Timothy himself had died within an hour of his mother. It seemed to Leander that Argus had woven an intricate fantasy for himself in which the boy had lived. Argus had been dying, and all Leander had wanted was to comfort him. The aged mage had asked for his vow, and to give him solace Leander had agreed, promising that he would look after Timothy as if the boy were his very own son. One final, rattling breath had been Argus’s only response, and then the sorcerer had succumbed to the one enemy magic could never overcome. Death had whispered through Argus Cade’s bedchamber. The old man’s eyes were dull, his chest still, and the light in the room, even in the world itself, had diminished. In the rush of details that followed, the many things necessary to prepare a suitable memorial, Leander had pushed his grief aside. It lingered, though, a hollow ache in his chest and the pit of his stomach, and Argus’s final words also lingered, echoing, coming back again and again. Yet it was with a certain dread curiosity that he glanced now through the window as the carriage drew up in front of the Cade estate. The house was enormous. It had been shaped and reshaped many times upon the whim of its master. Gables jutted from the roof and vine-covered latticework spilled down the sides, dangling below. Only the southernmost side, where the house faced the peak of August Hill, was anchored to the ground. Otherwise it sprang from the hill at an angle that seemed, in comparison to the level homes in most areas of the city, to be a spectacle of strange geometry. The navigator moored the carriage at the base of the grand staircase at the front of the house. “Shall I wait for you, Master Maddox?” the navigator called down to him. Leander pushed open the door and stepped out over the sheer drop down August Hill, onto the staircase that lay in the shadow of Cade mansion. He glanced up at the navigator’s veiled face. With that, he left the navigator and began the trek up the marble steps in front of the house. Far below, Leander could see the city, the golden lights that gleamed within the homes and the scarlet ghostfire of the street lanterns. An orange glow flickered at the center of Arcanum, and it warmed him to see that the remains of Argus’s funeral pyre still burned. It was as though the old mage had not gone yet, not completely. There was still a tether that connected Leander to his dead mentor, for another hour yet. Another hour. He waved his hand in front of Argus’s door and a flicker of violet light danced between his fingers, a spell that was a key. As far as Leander knew, he was the only person alive who had the spell-key to the Cade estate. He steeled himself for the task ahead of him, arranging the dead man’s papers, sorting what should go to the university for posterity from what ought to remain secret and known only to Leander. There was research Leander would continue on Argus’s behalf, but there were other things as well, things no one else should ever discover. That was the nature of magic. The door swung open. The house had been empty since its master’s death, all of the servants dismissed and everything left precisely as it had been. Leander passed a hand over the Alhazred dragon insignia upon the wall and the lamps blazed to life. The foyer of the great house was bathed in a warm glow that revealed the portraits upon the walls, the wooden gryphons that sat atop the posts at the base of the stairs, and the elegant Morrigish carpet that ran along the corridor ahead as well as up the circular staircase that wound through the heart of the house. Inside, Leander brushed his fingers thoughtfully through his thick beard. There was nothing for him to do but begin the work he had come for. He crossed the foyer and started up the stairs. Vertigo made him grasp the handrail tightly as he went up and up, around in circles; this staircase always seemed far longer to him than it actually was. If he chanced a look down, his vision would swim, for the foyer seemed so far below. Leander paused and shook his head, chuckling softly to himself. Argus had been fond of conjure-architecture, and it was just like him to build a staircase that would touch the senses, that would inspire thoughts of grandeur and magnificence. The young mage took another step and focused upward. A flutter of black wings slapped the air and talons swung down toward his face. “Caw! Caw!” screamed the raven as it glided past him, circling back around and then soaring upward. A moment later it came to roost half a dozen steps from where Leander now crouched with his hands up in defense. His heart was pounding in his chest and violet light sparked from his fingers, but now Leander drew a long breath and let it out slowly. There were other words, other curses, that might have flowed from him then, but instead Leander paused and stared at the rook. Slowly he shook his head. This was not right. Not possible. Many mages had animal familiars, companions whom magic had made far wiser than the average beast. The wizards of old had begun this tradition and some kept it up even to this day. This rook with silken black feathers and glittering ebon eyes had been Argus Cade’s familiar. But in all the lore Leander had read, and in all of his experience, a familiar was supposed to die with its master or mistress. Yet Edgar was not dead. The rook perched upon the curving stairs ahead, gleaming shadow eyes locked upon Leander himself, as though the bird thought him an intruder. A chill raced through his bones and images of Argus’s final hour flashed in his mind. Nothing was as it should have been. Edgar’s presence, Argus’s strange ravings. Before Leander could demand an explanation, the rook cried out again and took flight, soaring higher and higher up through the tunnel made by the circular stairwell. Leander called after him, but Edgar only cawed and then began to glide round and round under the high ceiling at the top of the house, like a carrion hunter awaiting the weakening of its prey. Leander climbed the remainder of the stairs at a furious pace, questions and suspicions, wonder and impossibility filling his mind. When he at last reached the top, Edgar circled his head. “Tell you? Caw! I’ll show you!” the bird replied, and with a single beat of his wings, Edgar began to guide him. The rook led him along one hallway after another, through doors he had never seen, and around corners that appeared to be solid walls until one looked at them from a certain angle. The entire place echoed with the whimsy of a conjure-architect. Argus’s fancy once again. There were halls without windows, and corridors with windows that showed impossible views, yet had no doors. At last the bird led him into a short, narrow, featureless hall without portrait, mirror, or tapestry. The only adornment in this particular corridor was a single door, sheathed in black fire and scarlet mist, barred by glittering green razor wire and blue ice. Edgar glided to the ground. When he had alighted, he hopped several steps nearer the churning magics that blocked the door. Then he tilted his head again and gazed at Leander. Holding his breath, Leander stepped forward and waved his hand in front of the door. Sparks of violet danced from his fingers and all of the magics that barred the door evaporated in an instant, leaving only wisps of black flame and the chill of ice in the air. Leander’s breath fogged as he gasped in amazement. The door sprang open, spilling bright light into the corridor. The rook’s wings fluttered again as he took flight. With Edgar just ahead of him, Leander went through the door. The white sun shone warmly down upon the Island of Patience, painting the sky a golden yellow that stretched far out across the ocean. In every direction was beauty and desolation, the sky above, the ocean below. The wind whispered through the tall Yaquis trees, their long fronds drooping down to hide the fat, juicy fruit that dangled beneath their branches. The surf washed upon the shores of Patience, and its hushed voice filled the air as if in response to the wind. On a rocky stretch of the small island’s shore, a tumble of enormous stones had been arranged into a promontory by time and the ocean’s whim. At the end of that jetty a boy sat upon his favorite stone and basked in the white sunlight. His body had a rich brown hue, like the skin of the Yaquis fruit, and he held in his hand a long pole carved from a branch of that very same tree, chosen for its flexibility. From the hanging leaves of the gnarled Horax trees, farther inland, he had made a strong twine. The boy had a mind for such things and had created a spool upon which to wind the twine and a crank with which to turn the spool. He had created this device, this fishing pole, at the age of six. It made the catching of fish far easier than wading the surf with a spear. In truth, he enjoyed fishing now, and why not? The warm stones beneath, the yellow sky above, the emerald ocean crashing against the rocks . . . and when the fish were ready to be caught and eaten, they would let him know by tugging upon the bone hook at the end of his line. It was called the Island of Patience, after all. Though he himself had given it that name. On this fine day, however, that tranquility was interrupted. The boy’s eyes went wide and he laughed happily as he launched himself up from the rocks. He nearly forgot all about his fishing pole, then paused to quickly crank the spool, reeling in the hook and the shattered shellfish he had used as bait. He could easily build a new one, but better to take care now. With the hook reeled in, he put the pole over his shoulder and leaped from stone to stone, deftly navigating the treacherous rocks of the promontory until he reached the shore. “Caw! Caw!” came the cry of the rook once more. The boy saw it ahead, circling high in the air. “Edgar!” the boy called excitedly. But in his heart, that was not the word he shouted. In his heart he shouted, Father! For the arrival of the rook meant that his father had come to visit him again. It had been so long—months, by the boy’s reckoning—that he had begun to despair of ever seeing his father again. The rocky coast gave way to beach, a broad expanse of red-hued sand that flew up behind his feet as he sprinted along the shoreline, eyes searching for the door. Then he saw it and his heart leaped. As always, the ornate door and its elegant frame had appeared where no door could possibly have been, hanging in the air above the red sand, just a few feet from the surf. The boy’s steps began to falter. The rook cried again and fluttered to land atop the door frame, perching there and gazing at the boy as he slowed his approach. The figure that had just emerged from the door and now stood upon the beach, just as out of place in that peaceful spot as the door itself, was not his father. This man wore a heavy, deep green cloak with the hood thrown back. He was startlingly tall and broad shouldered, with a thick beard and a dark mane of hair falling around his face in such a way that he reminded the boy of an image his father had conjured once during a lesson. The stranger reminded the boy of a lion. Yet he was not a stranger, not really. For though the face was unfamiliar to him, the boy had been given his description. His pace slowed. The boy walked carefully toward the man, his fishing pole slung across his shoulder. The man gazed at him with wide, astonished eyes, just as he gazed at everything else around him. The rook looked on, quietly observant. “You’re Leander Maddox,” the boy said, barely able to hear the rasp of his own voice above the surf. “I am,” the massive visitor agreed with a nod. The boy hung his head, gaze fixed upon his browned feet in the red-hued sand. 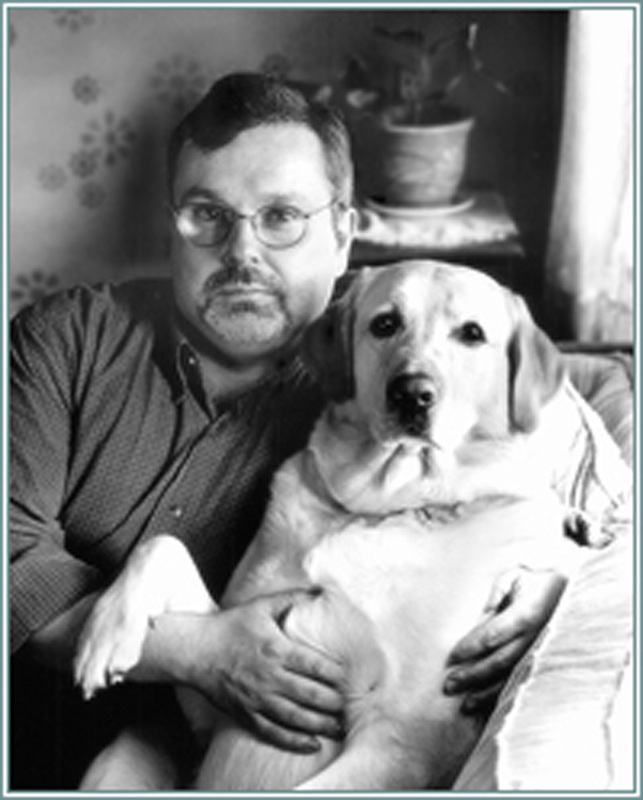 Thomas E. Sniegoski is the author of more than two dozen novels for adults, teens, and children. 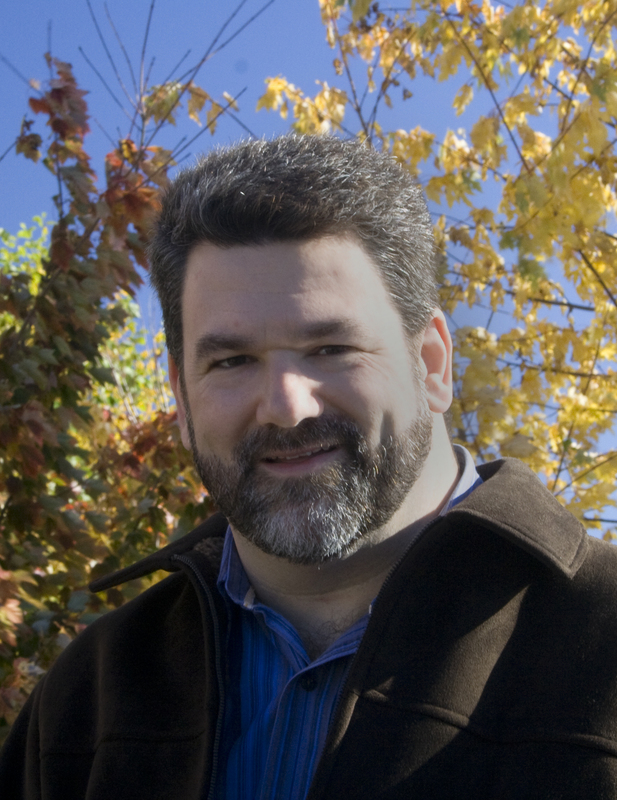 His books for teens include Legacy, Sleeper Code, Sleeper Agenda, and Force Majeure, as well as the series The Brimstone Network. As a comic book writer, Sniegoski’s work includes Stupid, Stupid Rat Tails, a prequel miniseries to international hit, Bone. Sniegoski collaborated with Bone creator Jeff Smith on the project, making him the only writer Smith has ever asked to work on those characters. He was born and raised in Massachusetts, where he still lives with his wife LeeAnne and their French Bulldog, Kirby. Visit him on the web at Sniegoski.com.